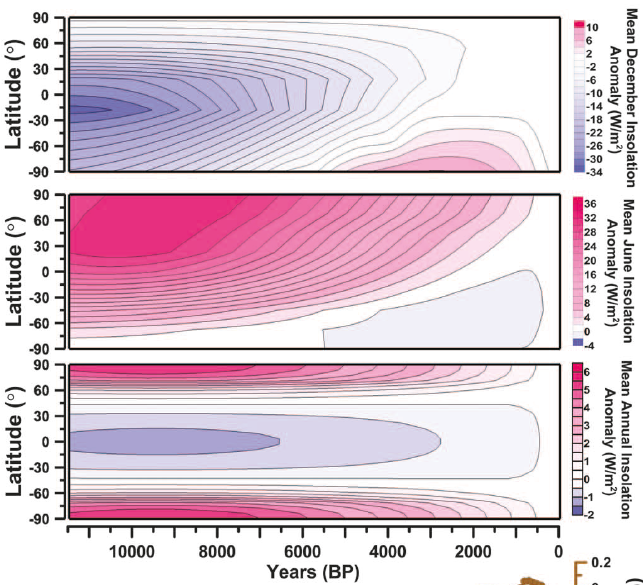 This is going to be quite upsetting to the MWP climate skeptics that think the MWP was the warmest period ever, warmer than the mid-Eocene high point, than the PETM, than the end-Permian. 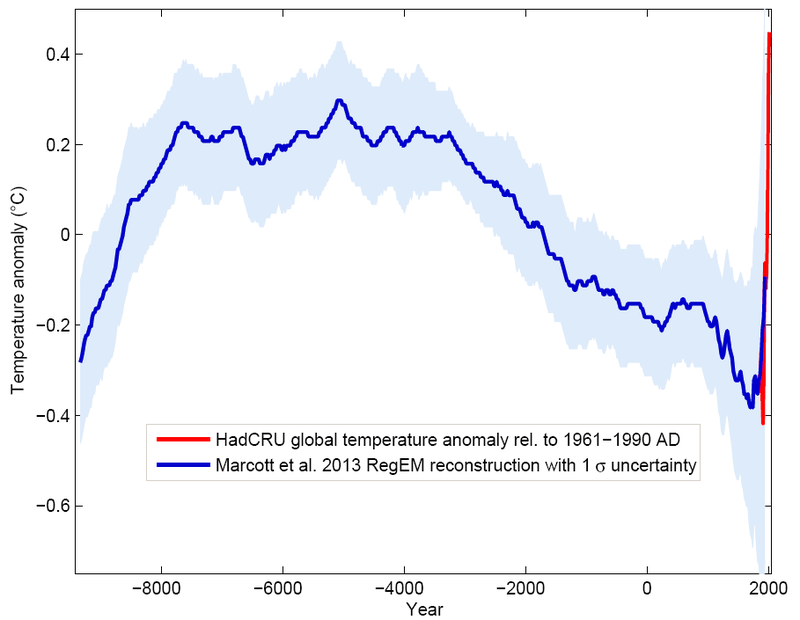 And what do I find in that 1st graph — it was warmer 7,000 years ago (at the -5,000 point) than during the MWP. I would think that we could build a new model that would make other models a lot less useful. The higher resolution alone would put it in a whole new league. Even if we had to de-fund an effort or two, at first glance it seems worth it to me. The 550 billion tons is tons carbon (GtC) and includes land use emissions. Without land use it is 365 GtC 1750-2010, according to this CDIAC data with the 2010 emissions figure of 9.167 GtC (excluding land use) = 33.6 GtCO2. Modeling anything over the century is bound to be uncertain. See this recent NY Times article on population trend. The greatest uncertainity is Africa, where population growth is perhaps the greatest welfare issue. Like global warming, not much is being done about population growth (China is the exception). That is also true of other major problems looming on the horizon, like drug-resistant microbes and government debt. The policy problem is to persuade countries not to downplay such trends because of the uncertainties, and to focus on likely “bad case” scenarios. But such policy making is seldom done, so it should be no surprise that few governments have been persuaded to deal with global warming. It is instructive to look at cases where long-term planning to prevent disasters has worked, at least so far – such a restraining the use of nuclear weapons and international economic systems. Both are based on concrete horrible events. The use of atom bonds in Japan, of course. The failure to establish a workable economic/political system after WWI led to WWII, and forced governments to accede to international regulations, such as the Bretton Woods agrements. So it’s unrealistic to think that governments will address global warning without definite, clear-cut and specific predictions of disaster. That is not in the cards. It will probably take the actual occurance of horrible events that can be tied to global warming, such as flooding of coastal cities. Most people do not understand that humans are part of Nature. Human activity figures directly into all natural processes. We are part of the Biosphere. The equation has to balance. You change one factor by adding or subtracting it to our environment. Be it the Biosphere, Atmosphere, lithosphere or outer space. it will change the existing state of our planet. I do believe that at the current rate that we humans are disrupting natural processes that Nature will take over and put things back into its owen order. The Earth does not need we Humans to survive as planet Earth. I wonder if we have enough smarts to save ourselves as a species. Like global warming, not much is being done about population growth (China is the exception). That’s not so. As Hans Rosling points out in this talk, “We have reached peak child”. The population increase now is more to do with the number of generations alive at one time rather than the numbers of children being born. The biggest thing we can do to control population is to make it easier or more desirable for women to delay marriage/ the birth of their first child. When the average age of first birth increases by 8 or 10 years, from below 20 in far too many countries to well over 25 for example, the multiplier effect through grandmothers and great-grandmothers means that societies finish up with far fewer 4 and 5 generation families. When women need to be 16 or 20, 24 or 30 and 32 or 40 years older than currently to become grandmothers, great-grandmothers, great-great-grandmothers, obviously far fewer families will have a large number of generations as part of their contribution to total population as well as a much shorter overlap time for those that manage very long lives. That’s a far more achievable target. adelady, thanks for pointing out the importance of the element of mother’s age at time of first child in discussing population issues. If successfully implemented by whatever means, a global policy that successfully got women to postpone their first pregnancy till after fifty would be the only way to immediately start reducing population without either directly denying any woman the right to have at least one child, or going the route of some form of euthanasia (or even less pleasant methods). IIRC, this was one of the strategies used in Bangladesh to get average birth rates down from about 8 kids per mother to 3 or so. The US recently spent trillions of dollars bailing out criminals responsible for nearly bringing down the entire global banking system. What if we spent that money offering women around the world a thousand dollars for every year they delay the birth of their first (or next) child? My bet is that for a fraction of the total bailout money you could immediately reverse population rise and send the world fairly rapidly toward a much smaller global population without having to ‘cull’ anyone or ask anyone to take on too burdensome a responsibility. Of course, then you would still be left with the other part of the equation–consumption. leave ever so many couples childless, and would dramatically increase ailments in both child and mother. 30 is a reasonable target, methinks. They have got the fameous bump in the curve starting 12900 years ago and lasting 7-900 years onward, the big freeze, younger Dryas. Discowered in twoo small lakes in Jylland. Denmark. This phaenomena has been shown to corelate in time with the lake Agazzis cathastrophy of North America, and even asteroides have been discussed for the cause of it. However, as far as I could see, the very fameous Eiffel vulcanism has been totally ignored as an explaination. It did explode quite exactly 12900 years ago and kept on for the same 7-900 years, giving up to 15 meter thick layers of tuffstone near to the Eiffel area, and ash layers are found north to Skåne in Sweden. Mankind had to evacuate to Northern Irland, Finnmark, Aserbadschan, Malta, and Portugal. But after it had settled, the central EU became very much greener than before, with exellent wines and fruit gardens. The tuffstone is interesting. It is more resistant to acid rain than limestone and sandstone. It is light and it can be sawed. “VulkanEiffel” and Maria Lach is worthy of a visit. My brother lived at Bonn bad Godesberg and there were very fertile fruit gardens around in the hills, and looking like burnt ashes and glass smellig of sulphur in the quite obviously vulcanic bedrock. Thus, think of Eiffel vulcanism next time you write about younger Dryas and the big freeze and check it up. And you may score a peer rewiewed article about it in Nature. “Younger Dryas” is named after Dryas octopetala L., which is a very fine flower on the Tundra and in the high mountain plains even today. Rosaceae. And the conscept of “dryas” & the big freeze of younger Dryas discovered in 2 small lakes of Jylland, Denmark. OK folks, if this is true, you can keep that Eiffel vulcanism and youger dryas with big freeze as a mark of dramatic events that have not happened since then. What if we simply spent that money to meet the already existing, huge, world-wide unmet demand for access to contraceptives and family planning services? There are tens of millions of women all over the world who already want to reduce the number or frequency of births, but are unable to do so because they lack access to the necessary tools and information. Carbomontanus, when it comes to volcanic cooling on a *global* scale think latitude: the volcano must be in the tropics for its aerosols to cool both the northern and southern hemispheres. The Eiffel is pretty far north to do so. 1. Has any correlation been made between space weather, volcanic eruptions, earthquakes and the relatively recent rise in C02/temperature? 2. 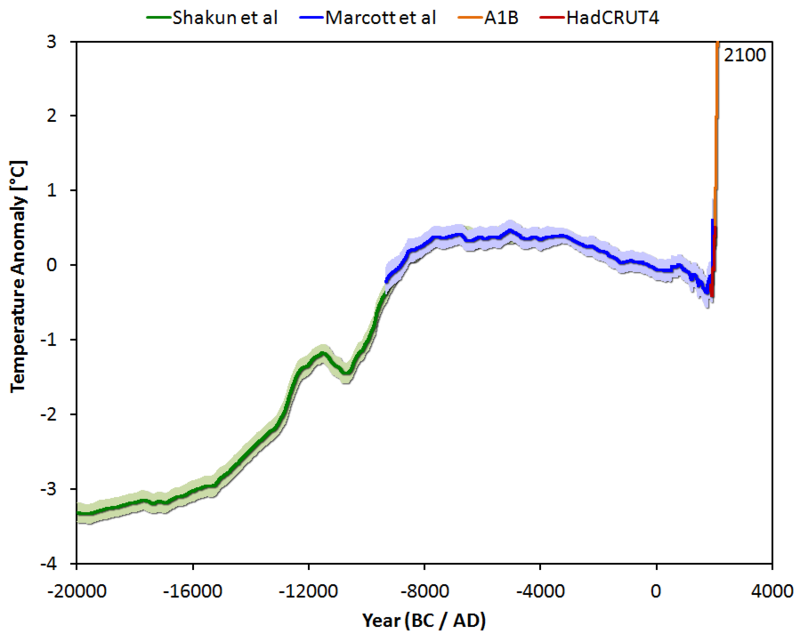 Have any of the studies of moon or mars soil shown evidence of recent climate change? 3. Why does the most recent summer show feel as if we are cooling if we are in global warming? 1)No strong correlation exists between warming and space weather. Volcanic eruptions can cool the planet. 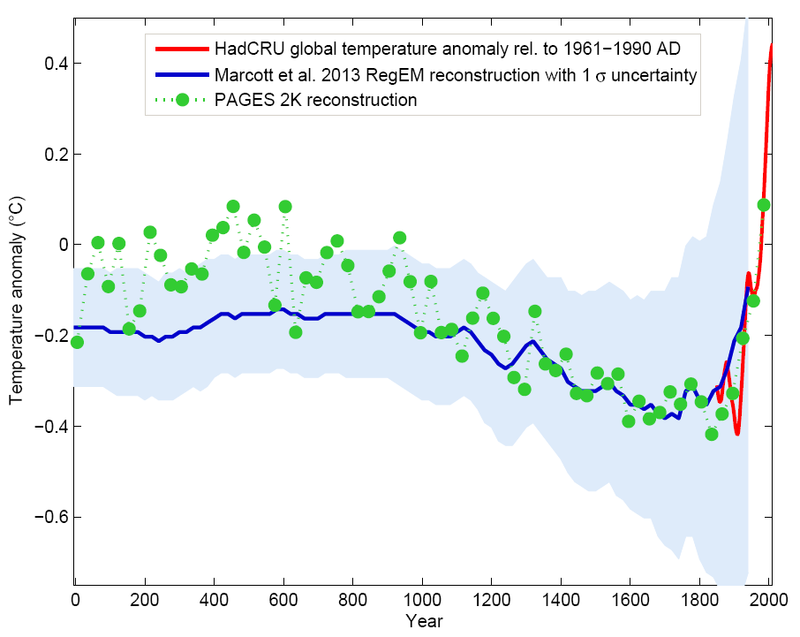 They don’t explain 40 years of warming. 3)Climate change does not imply an end to weather. i want each and everyone of you to do this simple experiment. just write down when you last saw a frost this year. When did you first see a frost? jb @65 You need to clarify your request a bit, looking for anecdotal evidence of [something?]. When I last saw a frost this year would have been sometime in the spring, I didn’t make a note of the date – when I first saw a frost as a kid would have likely been the first time I was taken outside in the fall, maybe about 1 year old. The former would have been in far western Canada, the latter would have been in Detroit. What does this tell us about . . . anything?